Timberlink Sienna sleepers are ideal for decorative landscape applications such as garden beds and sandpits. The long-lasting, beautiful red-brown colour provides the appearance of expensive traditional hardwoods at a fraction of the price. 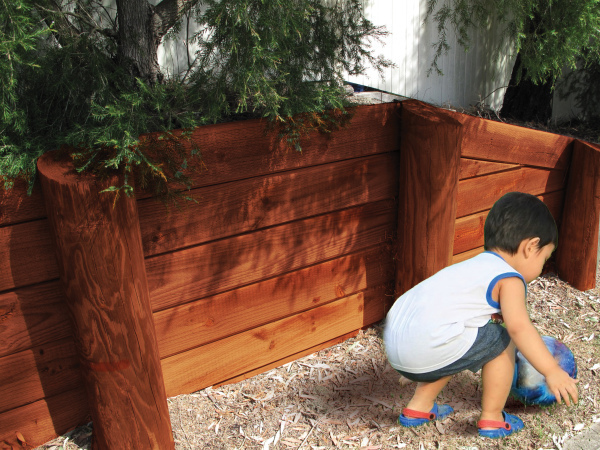 Non CCA treated, the Copper Azole treatment means that Sienna Sleepers can be used in applications likely to involve direct human contact, such as children's playgrounds. Suitable for non-structural applications only. Produced in our Tasmanian mill from sustainable Australian plantation pine. Available in both Tasmania and Western Australia. Corrosion resistant fasteners, fixings and connectors, such as hot dip galvanised or stainless steel are recommended for all exterior, above ground applications. Sienna sleepers are fully compatible with aluminium building materials. Sienna sleepers may be painted with a water repellant, which will ensure optimum serviceability, appearance and dimensional stability. Where Sienna sleepers are cut, notched, drilled or rebated the exposed areas should be resealed with a suitable resealing product to ensure that the treatment envelope for durability against fungal and termite attack is maintained. When handling and cutting any timber, it is advisable to wear dust masks, goggles and masks.